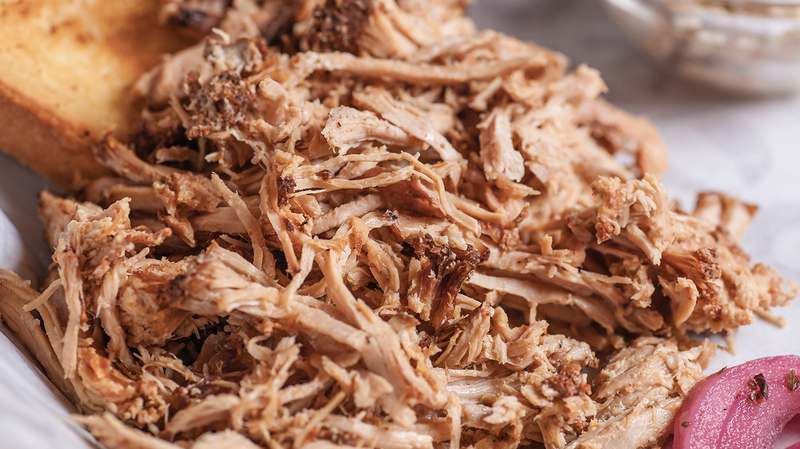 Prepare this crispy carnitas on the weekend and be ready for a week of tacos, burritos, and nachos! Or go all out with Southwestern Chimichangas for Sunday Brunch. Combine the kosher salt, chili powder, oregano, cumin, and lime juice in a small bowl. Whisk to combine and rub the mixture evenly over the pork shoulder. Heat a Dutch oven over high heat. Heat vegetable oil in the Dutch oven to shimmering. When the cooking oil starts to shimmer, add the pork shoulder and brown it on all sides. Add juice from the orange, broth, onion, and garlic to the Dutch oven and deglaze it to loosen the browned bits. Add the orange halves, cover the Dutch oven, and bake for 3 hours until the pork is very tender. Remove the pork shoulder from the Dutch oven, pour the liquid through a strainer into a fat separator and discarding the solids. Shred the pork with 2 forks and return the pork and the defatted liquid to the Dutch oven and bring it to a simmer over medium heat. Simmer the mixture, stirring occasionally, until all of the liquid evaporates. Increase the heat to medium high and sauté the pork until it is crisp on the edges.